The M'Goun valley is located in the central part of the High Atlas Mountains. From an administrative point of view belongs to the province of Ouarzazate. The M'Goun summit is a popular destination for hikers trekking practicing even if you don’t enjoy the same prestige as the Toubkal. Accidents during M’goun ascent are rare in view of the relatively low altitude of this mountain and the lack of glacier. An unforgettable trek to mount M’goun for Lovers of the great outdoors, spectacular scenery and unforgettable meetings, this trip is yours! 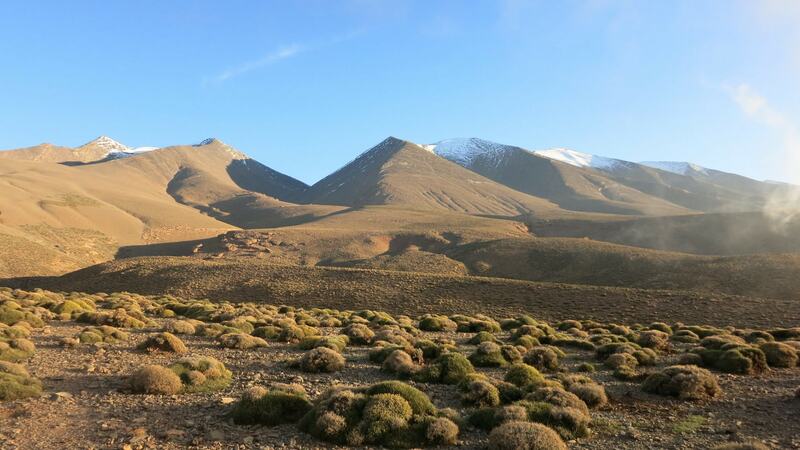 We will be conducted east of Marrakech, in the heart of the Moroccan High Atlas. Throughout our journey, the high altitude, plateaus, canyons, valleys and rivers provide spectacular dimension to your trip. Then we will visit the "Happy Valley" of Bougmez, an oasis of greenery, before finishing with the visit of Marrakech and its many treasures. Agouti to Arous. Camp overnight. Trek to Tarkedit Plateau We walk up in a wild landscape before crossing the Aghouri pass at 3,450m then descend to the wind-eroded and snow-covered high plateau of Tarkedit (2,900m). After lunch (there is a hut on the plateau), we climb up to the southern side of the plateau and establish a camp at 3,400m, directly below M'goun West (3,978m). 7-8 hours walking. Camp. Ascent of Djebel M'goun (4,068m) to Oulilimt Today we make our ascent to the summit of Djebel M'goun. The climb follows a long ridge, all at or above 4,000m, which typically takes between 4 and 5 hours to the summit, depending on snow conditions. From the top, there are impressive views across the Draa valley and towards the Sahara Desert to the south. We descend back to Azib Izabine. 8-9 hours. Camp. Trek Down the valley into Ain Aflafal and to Tighermet n Ait Ahmed (5hours walking). Camp. Climb Tizi n'Ait Imi (2960m) then long descent to Ait Bougmez valley and drive back to Marrakech.